RICHMOND—Jackson Custer Reavill passed away peacefully on January 22, 2019 in Richmond. He was 78. In life, however, Jack was anything but quiet. He was energy in human form and captured the attention of any room he entered. He was an endless source of jokes, even though there’s no evidence that he knew any good ones. And he had a heart as big as his personality. Jack was born on May 5, 1940, in Vincennes, Ind., to Alberta and Frederick D. Reavill. He grew up in Flat Rock, Ill, the younger brother of Lonna and Frederick W. As a farm boy, Jack developed his work ethic early on and put it to good use throughout his life. He was always working on some project, and he never met a tool that he couldn’t put to an improper use. Jack graduated from Robinson H.S. (Robinson, Ill.) in 1958 and went on to the U.S. Military Academy at West Point, graduating in 1962. He was a vital part of the Class of 1962’s leadership team. He earned his master’s in nuclear physics from Tulane University in 1972 and was a 1983 graduate of the U.S. Army War College. Jack proudly served his country as a field artilleryman for 26 years. He was awarded the Bronze Star for combat service in Vietnam and later commanded a field artillery battalion in Wiesbaden, Germany. His other assignments included work at the Defense Nuclear Agency and the Pentagon, and took him to other locations in Germany, Korea, and throughout the states. 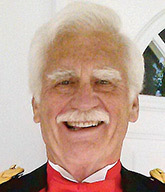 Jack was awarded the Defense Superior Service Medal and retired from the Army as a Colonel in 1988. He was a passionate athlete—particularly when it came to basketball, lacrosse, football and squash. Jack was especially proud of having played in the 1962 North-South All Star lacrosse game, which delayed his wedding date; Susie, his bride-to-be, was less excited. Part farmer, part soldier, and part athlete, Jack was all family man. He is survived by Susie, whom he met when they were 14. In their short 64 years together, Jack and Susie welcomed four boys, Jackson II, Kirk, Bradley and Jonathon; six grandchildren, Caitlin, Monte, Haleigh, Aidan, Blake and Kellan; and two great-grandchildren, Ryleigh and Reagan. Jack was a father figure to many others, too, and embraced the principle that family stretches well beyond blood lines. He was active in his community, as well—including Wicomico Parish Church, where he had served on the vestry. In addition, he had been a member of the KIWS Rotary Club and served as president of the Northern Neck Chapter of the Military Officers Association of America. Jack’s interests were diverse. Notable among them were his love of classic cars and tractors, “working the land,” and genealogy. And, in addition to Susie, books and Sports Illustrated were constant companions. Jack lived for conversation. He loved to talk. A lot. To anyone. About anything. His voice will be sorely missed. In lieu of flowers, please consider making a donation in Jack’s memory to The Fisher Center for Alzheimer’s Research Foundation, www.alzinfo.org, or to AT Home Care & Hospice, www.athomecareandhospice.com.